Ceiling fans create a relaxed ambiance in a room and cost less to operate than air conditioning. Whether in a large formal dining room with vaulted ceilings or the casual environs of a farmhouse porch, there is a model out there to fit any style or practical application. Traditional ceiling fans have rounded fan blades and bulky housing for the mechanical parts at the ceiling. However, they do not have to be this way. As an example of more contemporary style, this model has a very trim profile with thin rectangular blades and minimal mechanical housing. Not all ceiling fans include a light fixture, but most do, so you will need to consider the lighting you want for the area where the fan will go. This candelabra-style light fixture is geared for a traditional interior and will cast diffuse light desirable for dining areas, but is less appropriate for a kitchen or work space. A compact six blade model with a simple glass globe is about as straightforward as a ceiling fan can get. It has slightly angled blades and ceiling-mounted motor housing, and is multi-speed and reversible for four season use. Measuring 30 inches in diameter, it is at the small end of the spectrum and is suitable for rooms under 80 square feet. This is a ceiling fan for the future. The spinning of the small fan blades causes the entire unit to rotate on its vertical axis, distributing air more evenly throughout a room and helping to conserve heating and cooling costs. Conceptually, its design is based on the molecular structure of water - the fans are the two hydrogen atoms and the mechanical housing is the oxygen atom. It is engineered for ultra-quiet and wobble-free operation. It doesn't get classier than this fan. The rubbed bronze finish, tapered fan blades, and amber-textured glass light cover all exude the elegance of a traditional ceiling fan. A perfect fit for a historic home or a contemporary one with classic style, this model includes a remote control as an added convenience. Another take on the bi-axial fan concept, this version would be great in a converted warehouse apartment. Highly durable with all bronze construction, it also pushes a lot of air with an adjustable speed control that can crank up to 1350 rpm (revolutions per minute). Like most of the top quality models, it comes with its own wall-mounted control. This fan is a thematic option, with a light fixture resembling something you would see on a boat or dockside area. It is made entirely of stainless steel, making it suitable for interior or exterior applications and would be a great fit for an ultra-modern home that featured other stainless steel appliances. Another metallic fan, this one has an almost futuristic look. Visually, its spiral-shaped blades are mesmerizing to watch as they spin and it is a rare model designed to push air at an angle rather than straight down. It is designed to be mounted on a pitched ceiling where there are few other options. This model by George Kovacs pushes the envelope of design with a fan that would be perfect for an art collector. 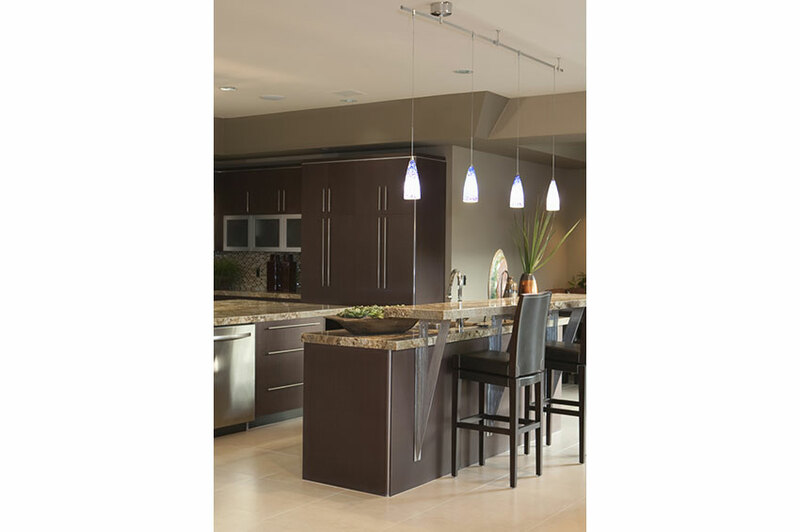 The six blades of varying sizes and angles push air in all directions and the light fixture is outfitted with high-quality halogen bulbs. This fan definitely makes a statement - but with a brushed nickel finish, a wall-mounted control system and a lifetime warranty, it is quality worth paying for. Modeled after an authentic turn-of-the-century style, this ceiling fan is unusual because it has only two blades. They are extra long and powered by an oversized motor, however, so it still pushes a lot of air. The distressed, furniture-grade basswood blades and detailing on the motor housing are fine touches that were common on ceiling fans one hundred years ago, but difficult to find today. Brushed nickel and black blades make a simple stylish statement with this model geared for a contemporary home. It's also Energy Star certified, so it's easy on the wallet, as well as the environment. With a 52-inch diameter, it is sized for a medium to large room. This fan is an alternative to the many sleek modernist designs that can be a bit austere. Featuring a warm, koa wood finish - a hardwood from the Hawaiian islands - this model is easy on the eyes and creates a light and airy ambiance. It has an energy-efficient, dimmable LED light fixture and would be right at home in a modern, eco-designed house. It's always a good idea to check the energy use of a fan/light fixture combination before buying. The more efficient it is, the less you will spend in the long run. Purchasing a ceiling fan is yet another opportunity to reduce energy use and contribute to a cleaner, greener planet.